Safety is our first priority. 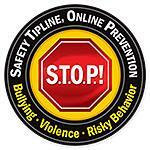 In an effort to use every able resource to STOP bullying and other risky behaviors in our schools, Russellville Independent Schools proudly announces the implementation of the “Safety Tipline Online Prevention” or STOP! Tipline. The STOP! Tipline is designed for use as an "online" reporting/prevention tool which is provided free by the Kentucky Center for School Safety. If students, parents or community members know of an unsafe situation in school (bullying, weapons, drugs, alcohol, etc. ), they can anonymously pass on that information to school personnel by using this basic email format. “Our hope is that students who fear face-to-face reporting of bullying or other safety issues may be less reluctant to share this vital information when offered an “online” option”, says Bart Flener, Superintendent of Schools . “By giving students the ability to report concerns over their tablets, computers, or mobile phones, we can reach more students and address problems before they escalate." “This tip line is just another powerful tool in our arsenal against bullying, harassment, and other unsafe behaviors in our schools. Our Comprehensive Safe School Plan is ever evolving to keep our students and staff safe, and we are using every resource available to do so,” says Superintendent Flener.